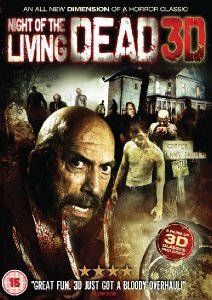 Both an homage to and a re-make of the original George Romero 1968 classic film, this update follows a group of survivors trapped in a farmhouse battling a siege of undead zombies....in 3D! Barb and her brother Johnny arrive late for the burial of their aunt -- and walk straight into a nightmare. With zombies on her heels, Barb flees the cemetery and is rescued by Ben, a local college student. The two seek refuge in the nearby farmhouse of the Cooper family, where the laid-back residents aren't remotely prepared to have their lives turn into a horror movie. But Barb is destined for an even grimmer confrontation -- with the local mortician, Gerald Tovar, Jr.